You are here: HomenextPlacesnextParks and gardensnextHove ParknextWhere was this model train? This is my great grandad Guy Edwards 1890-1977. He was a draughtsman at Allen West, and he had a work shop where he built trains like this as a hobby. He was born and lived mostly in Brighton before emigrating to New Zealand in the mid 1960s, he then returned to Hurstpierpiont. Does any one recognise train and know where it was and if it still exists? I know he was a volunteer with Volks Railway but am not sure what he did. Is it not the miniature railway at Hove Park? 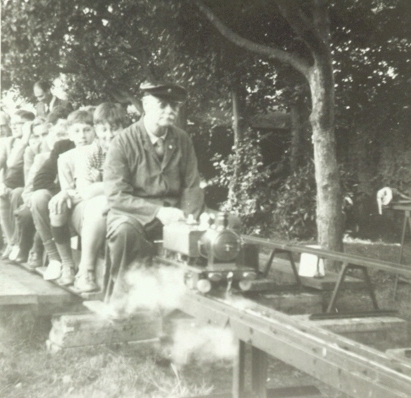 This small gauge railway was an attraction at Hove Park, if I’m correct. There is still a miniature railway at Beechurst, Haywards Heath which, according to my husband, has been there at least 50 years. Maybe this one? If I remember correctly, this was in Hove Park, and ran until not so long ago… well, the track at least was there till the 1980/90s. I think it was run by a club of model train enthusiasts. If he lived in Hurstpierpoint, was it the minature railway at Beechhurst Park in Haywards Heath? It is still running today. It’s the small train in Hove Park, still there today although changed a little. I remember the original line in the photo, 2 tracks ran side by side, which meant that they had to shunt backwards when they got to the end of the line. The original track was badly damaged in the 1987 storm, and then totally rebuilt, but in a circular track. The track supports are now in cast concrete, different from those in the photo. The line still runs today, I think either Sat or Sunday in the Summer and Bank Holidays. I think the line is celebrating 100 of model engineering in Brighton (not 100 years of the railway) this year. Yes, it’s Hove Park miniature railway alright. I live nearby and see it running! It operates on the last Saturday of each month from March to October in the afternoon, plus Bank Holiday weekends on the Saturday and Monday. It still has a twin track as shown in the photo, but there is a loop at each end to form a continuous circuit. Thanks everyone for telling me where this is. I must try to see the train in action next time I am in Sussex. Yes, I remember it well. Hove Park miniature railway. Back in the 50s I used to ride it with my friend Susan – we even got our photo in the local paper, though I can’t recall whether it was the Evening Argus or the now defunct Brighton and Hove Herald. This is Hove Park, run by Brighton and Hove SMLE (Society of Model Locomotive Engineers). When first built, the railway was 2 parallel lines built of metal, seen here. Later it was rebuilt into a big loop using wooden rafters supporting the track, with one of these lines as a test track. Then after the great storm of 1987 the wood was replaced with cast concrete sections that look like a railway viaduct designed by one of the members.